Although technology might be advancing at a breakneck speed, one thing always stay the same: we audiophiles have high standards. We want our sound to be clear, we want it to be full and, perhaps most importantly, we want it to be true to the original source. Although the principles of stereo sound may be decades old now, and it's single unit speakers that are dominating the audio market, audiophiles far and wide still believe that two speakers really are a whole lot better than one. But although that may be the case, actually finding a set of speakers that ticks all of our boxes is much easier said than done. So with that in mind, on our quest for the best stereo speakers on the market, we spoke to some of the best audio companies on Earth to review and test a wide variety of stereo speaker setups, ranging from compact bookshelf speakers to room-dominating towers with built-in subs. We will be reviewing more units in the future and adding them to this list, so keep your eyes (and ears) peeled for that. In testing these speakers, we compared each stereo set at a comparable power level and tested the same tunes, plucked a variety of music genres. Our test songs spanned the dynamic range of music and artists, from John Mayer to Tom Petty, and from U.K. prog-metal band TesseracT to the likes of John Williams and Hans Zimmer. Each song was chosen to test the dynamics offered by each set of speakers with some speakers reacting better to certain genre’s than others, depending on their design. Of course, not all speakers are created equal in function. The Definitive Technology BP9080x towers, for example, are obviously made to cover a more broad frequency range than say the Edifier bookshelf speakers with a 4 inch woofer. We used to our best judgement in testing these speakers according to their individual purpose and affordability, and graded them with that in mind. Since comparing bookshelf speakers to high performance towers is an obvious case of apples and oranges, we’ll at least try to make it clear which speaker is an apple and which is an orange. Sound good? Good. Without further ado, these are the best stereo speakers we have tested so far. What are the best stereo speakers? In life, money isn’t everything. In sound, however, it’s pretty important. Case in point: the Definitive Technology BP9080x speakers. Right off the bat we want to make it clear that this stereo pair is a luxury item that is made only for the most avid audiophile on the market. If that’s you, then let us tell you just how amazing these speakers are. From beginning to end of the covered frequency range, the BP9080x speakers are crystal clear, articulate, and genuinely moving. The passive design is aided by an active subwoofer, giving the user independent control of the subwoofer volume on each tower, meaning it can be adjusted to fit any room with any standing waves. The midrange is as full and clear as any speakers we’ve ever heard, never getting overworked or muddy no matter what songs and sounds we threw at it. The pitch-perfect mid range blends perfectly into the gorgeous treble frequencies that never got harsh, even when the windows were shaking from the volume. The clarity from the top of the frequency range to the bottom can’t be overstated. On top of it all (literally) there are two “height channel” speakers that make this a perfect centerpiece in your Dolby Atmos or DTS:X home theater. All of this audio goodness is wrapped in a tall and slender package made from premium materials that is impossibly discreet, especially considering the amount of volume it can pump out. All we can say is that if you’re looking to spend the money (and it is a lot of money), we can’t recommend Definitive Technology’s BP9080x speakers enough. Since 1985, the Forte floorstanding speakers from Klipsch have been the gold standard for home entertainment. Now, the Forte III speakers are on the market and hope to build on the success of their forebearers. Of course, as you might expect, these speakers sound fantastic. Klipsch’s attention to detail on the fine tuning of the speakers is second to none, making way for a clear and intricate mid-high range. They’re also phenomenally designed and built, making a great addition to basically any living room. They are also very heavy, which can be a blessing and a curse. Once you figure out their place in the living room, these speakers aren’t going anywhere. These speakers are built for bass, with a 12 inch subwoofer and a massive 15 inch passive radiator in the back of the speaker to help disperse the low frequencies. To get the most out of the bass speakers on these towers, you need to run two separate amps, or a single amp with multiple outs that is strong enough to get the subwoofer moving. Having separated or bi-amp control allows the user to control the power sent to the high and low channels, allowing them to get the exact balance they want. The downside to these speakers is that they are even more expensive than the Definitive Technology BP9080x speakers and don’t have the powered subs or high-firing speakers that our number one pick has. Part of that premium is paying for the Klipsch name, but there is quality to back it up - just not enough value or pure sound power to topple the Definitive Technology BP9080x. If you’re not in the market for full-on entertainment behemoths like the Definitive Technology towers, the Klipsch RP-150M speakers are a surprisingly affordable bookshelf speaker option with a mid-range and high frequency clarity that rivals our top pick. These light and passive reference speakers are beautifully designed and are a continuation of what Klipsch does best: honest and clear replication without over-coloring the sound. While the 5-inch woofer doesn’t do much in the way of bass, not coming audibly close to the 48 Hz promise on the frequency response, these speakers have a surprising amount of low-mid thump. The mid range in these Klipsch speakers is completely clear and open, allowing for subtle articulation to come through that would be lost on lesser systems. The upper range never gets shrill and has a natural air under it that seems to be a signature in Klipsch products. Overall, if you’re looking for a solid pair of stereo speakers for casual listening, studio work, or piecing together an entertainment system, these Klipsch RP-150M speakers are just about as good as they come, especially for the price. If you’re starting to take your music listening experience more seriously, it’s natural to look into getting a speaker setup. That is until you realize that you’ll have to pick a preamp, amp, and DAC to get your dream speaker setup. That’s a lot research and setup, which is quite intimidating to a hi-fi newbie. But what if there was a speaker system that just worked out of the box? What if all you had to do was plug the speakers into the wall and turn on some music? Thankfully, this dream system is real and it’s made by the folks at KEF. After spending several months with the KEF LS50 Wireless, we were blown away by the package that the company was able to engineer. The speakers offer mind-blowing sound quality with absolute neutrality, hologram-like imaging, and an expansive soundstage. Plus, it was dead simple to set up and use from any of its sources. While not cheap, the LS50 Wireless is actually quite a bargain when taken as a complete package. If you’re an audiophile who’s in the market for compact bookshelf speakers but doesn’t want to sacrifice on sound quality, it’s time to look at the Q Acoustics Concept 20 speakers. These extremely low-profile bookshelf speakers are rich in sound from the low-mids to the crispy highs. Even with the amplifier cranked (to safe power levels) the sound never broke up into distortion and remained clear, not shrill. Of course, with any speakers this size, there wasn’t much bass below the low-mid range to speak of, but what was there was full without being muddy. What could be seen as a pro for some and a con for others, the Q Acoustics Concept 20 speakers are passive and require an external amplifier. For audiophiles, this is a great excuse to drop even more coin on a high fidelity amplifier to get the best possible sound out these already great speakers. For casual listeners, however, it can be an inconvenience to worry about amplification with what should be small and discreet bookshelf speakers. After testing songs of every conceivable genre, it’s clear that the Q Acoustics Concept 20 speakers are up to just about any challenge. For those looking to fill out the living room with clear, crisp, hi-fi sound, these bookshelf speakers from Q Acoustics are a no-brainer. The beauty of Polk Audio is in its ability to make quality speakers that compete with the biggest name brands while keeping a lower price tag. Do these beautiful full range Polk Signature S60 towers stand up to the prowess of the Definite Technology BP9060x towers? Well, not exactly, but these are stellar speakers in their own right. Polk’s passive signature series speakers for home entertainment are designed to provide full and immersive sound, and for the most part, they hit the mark. The mid-range, which is the easiest to muddy up, is crystal clear and articulate no matter what sound is blasting through these almost four-foot tall towers. The high frequency range is certainly lively, occasionally to the point of shrillness when the volume is really pushed, but never gets too harsh for comfort. As for bass frequencies, the packaging advertises a unique porting system that allows more low frequencies to travel more easily. However, to hear the bass really cutting through, the volume needs to be cranked quite a bit. Still, overall the sound quality is excellent in these Polk Audio speakers, the frequencies might could just use a little tweak with an external equaliser. If you’re looking for a more affordable alternative to the Definite Technology towers, the Polk Audio Signature S60 speakers are a solid option that will likely outshine just about any other run-of-the-mill home entertainment system you’ll encounter. While they don’t handle the highs or the lows as well as our premium pick, we have no doubts that even the most critical ears will be happy with the signal these bad boys pump out. These stylish and compact Q Acoustic BT3 speakers are the most digitally integrated speakers on our list, featuring Bluetooth capability, a remote control, a 3.5mm input, a digital optical input, and active speakers. But how does the sound quality compare to the rest? The sound that came out of these little speakers was shockingly full. Q Acoustics designed these speakers primarily as a convenient bookshelf speaker, but also as a stereo alternative to the soundbar, and it was clear why. The BT3 speakers covered virtually the entire frequency range very evenly, with the exception of the sub bass. Still, the bass that was produced was thick and full and didn’t cause the signal to overly distort. The high range was also surprisingly manageable, though a bit more shrill than the pricier Concept 20 speakers or the Klipsch RP-150Ms. While the BT3 speakers from Q Acoustics won’t replace your favorite reference monitors any time soon, they weren’t really designed to. These speakers have a lot of technological integrations that make them a perfect replacement to a traditional soundbar or a simple solution to bookshelf speakers. With Bluetooth integration and remote control, the BT3 speakers are perfect in the corner of the living room when you want to quickly blast your song through the house, and sound good doing it. The Edifier R1280T speakers are a popular choice on Amazon, and for good reason. These compact desk/bookshelf style speakers back an impressive sonic punch and look good doing it, all while keeping the price tag under $100 for the pair. Ok, it’s $99.99, but that penny really does count! The standout features here include its active design, rich mid-range response, and surprisingly competent bass. Because of the small woofer size, these guys obviously don’t push much low-end, and because of the tweeter design, the highs aren’t as clear as the competition we tested. But other than that, the frequency response and clarity holds its own pretty well. While they don’t compare to the encompassing power of the Definitive Technology BP9080x or even the clarity of the Klipsch RT-150Ms, these compact speakers certainly serve a purpose. If you’re looking for an affordable set of computer speakers, or better yet a warm stereo set up for your turntable, the Edifier R1280T speakers are a fantastic option for the money. KEF has long been a major driver in the world of audio innovation since launching in 1961, and with the LSX wireless stereo speaker system, the company has set out to prove that you can achieve audio perfection with even the most compact speaker. Separation among the different frequencies is brilliant, and the overall sound is extremely well balanced, with no one frequency overtly dominating the others. 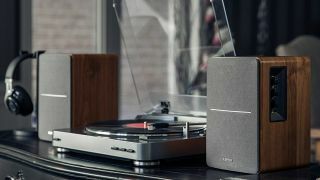 For their size, the speakers perform very well when it comes to sub-bass, although you can connect them to an external subwoofer if you find they don’t quite hit the spot. Where these speakers shine is in analogue sound; vocals, pianos, and acoustic guitar are given a timbral warmth without taking away any of the clarity provided by the brilliant phase correction and distortion reduction. The Roku TV Wireless Speakers may be some of the best speakers to use in a bedroom because of the voice clarity and sound leveling features which will enable you to listen with full sound without annoying the neighbors or waking the children ... that is, as long as your bedroom television runs Roku TV. As great as these speakers are, they only only work with Roku TVs from TCL, Insignia, Hisense, Sharp and others. They won't work with Roku streaming devices like the Roku Ultra, which is why these speakers are sold exclusively at Roku.com so that Roku can make sure that you're setup for success. Beyond its limited availability, the Wireless Speaker's only fault is its anemic bass, due in no small part to the lack of a subwoofer. If you're after cinema-quality sound you'd be better off with a soundbar/subwoofer combo - like the ridiculously low-cost Vizio SB3621 - but, if you're looking for a late-night listening solution for your bedroom Roku TV, the Wireless Speakers are the way to go. These speakers are just one part of a great stereo experience, be sure to check out our list of the best turntables.